Okullardaki bilişim teknolojilerinin entegrasyonu için alan yazında en sık belirtilen engeller arasında hizmetiçi eğitimlerdeki sıkıntılar gösterilmektedir. Bundan dolayı FATİH Projesi kapsamında yürütülen hizmetiçi eğitimlerde öğretmenlerin karşılaştığı aksaklıkların belirlenmesi yararlı olabilir. Bu çalışmanın amacı Türkiye’deki eğitim sistemine mobil ve etkileşimli teknolojilerin entegrasyonunu amaçlayan FATİH Projesi hizmetiçi eğitimleri hakkında öğretmenlerin görüş ve ihtiyaçlarını belirlemektir. Bu çalışmada araştırma yöntemi olarak nitel durum çalışması kullanılmıştır. Veriler bir lisedeki 15 öğretmenden yarı yapılandırılmış görüşme yoluyla toplanmıştır. Bulguların elde edilmesinde içerik analizi yapılmıştır. Elde edilen bulgular öğretmenlerin daha çok uygulama ağırlıklı, daha uzun ve çeşitli zaman aralıklarında tekrarlanan, farklı branşlar için özel hizmetiçi eğitimleri tercih ettiklerini göstermektedir. Akbaba-Altun, S. (2006). Complexity of Integrating Computer Technologies into Education in Turkey. Educational Technology & Society, 9 (1), 176-187. Albirini, A. (2006). Teachers’ attitudes toward information and communication technologies: The case of Syrian EFL teachers. Computers & Education, 47 , 373-398. Betts, K. S. (1998). Factors influencing faculty participation in distance education in postsecondary education in the United States: An institutional study (Doctoral dissertation, The George Wash- ington University, 1998). Dissertation Abstracts International, 59 (07), 237A. Bingimlas, K. A. (2009). Barriers to the successful integration of ICT in teaching and learning en- vironments: A review of the literature. Eurasia Journal of Mathematics, Science & Technology Education, 5 (3), 235-245. Bogdan, R. C., & Biklen, S. K. (2007). Qualitative research for education: An introduction to theory and methods. Boston, MA: Allyn and Bacon. Buabeng-Andoh, C. (2012). Factors influencing teachers’ adoption and integration of information and communication technology into teaching: A review of the literature. International Journal of Education and Development using Information and Communication Technology (IJEDICT), Vol. 8, Issue 1, pp. 136-155. Cox, M., Preston, C., & Cox, K. (1999). What factors support or prevent teachers from using ICT in their classrooms? Paper presented at the British Educational Research Association Annual Conference. Creswell, J. W. (1998). Qualitative inquiry and research design: Choosing among five traditions. Beverly Hills: Sage Publications. Cuban, L., Kirkpatrick, H. & Peck, C. (2001). High access and low use of technology in high school class- rooms: Explaining an apparent paradox. American Educational Research Journal, 38(4), 813–834. Denzin, N, K. & Lincoln, Y. S. (1994). Introduction: Entering the field of qualitative research. In N. K. Denzin & Lincoln, Y. S. (Eds. ), Handbook of Qualitative Research (pp.1-17). Thousand Oaks, CA: Sage Publications. Ertmer, P. A., Ottenbreit-Leftwich, A. T., Sadik, O., Sendurur, E. & Sendurur, P. (2012). Teacher beliefs and technology integration practices: A critical relationship. Computers & Education, 59, 423-435. Eteokleous, N. (2008). Evaluating computer technology integration in a centralized school system. Computers & Education, 51, 669-686. Franklin, C. (2007). Factors that influence elementary teachers’ use of computers. Journal of Tech- nology and Teacher Education, 15(2), 267–293. Holland, P.E. (2001). Professional Development in Technology: Catalyst for School Reform. Jour- nal of Technology and Teacher Education, 9(2), 245-267. Norfolk, VA: Society for Information Technology & Teacher Education. Marshall, C. & Rossman, G. B. (1989). Designing Qualitative Research. London: Sage Publications. Merriam, S. B. (2001). Qualitative research and case study applications in research. San Francisco, CA: Jossey-Bass. MoNE. (2015). 700 Bin Tablet Dağıtımı Gerçekleşti. Ratrieved May 29, 2015 from http://www. meb.gov.tr/700-bin-tablet-bilgisayar-dagitimi-gerceklesti/haber /8777/tr. Newhouse, P. (2002). Literature review: The impact of ICT on learning and teaching, Perth, West- ern Australia: Department of Education. Pamuk, S., Çakır, R., Ergun, M., Yılmaz, H. B. & Ayas, C. (2013). The use of tablet PC and inter- active board from the perspectives of teachers and students: Evaluation of the FATİH Project. Educational Sciences: Theory & Practice, 13 (3), 1815-1822. Patton, M.Q. (1990). Qualitative evaluation and research methods. Newbury Park, California: Sage Publications. Rogers, P. L. (2000). Barriers to adopting emerging technologies in education. Journal of Educa- tional Computing Research, 22(4), 455−472. Sandholtz, J. H. & Reilly, B. (2004). Teachers, not technicians: Rethinking technical expectations for teachers. Teachers College Record, 106(3), 487–512. Schifter, C. (2000). Faculty participation in asynchronous learning networks: Case study of motiva- tion and inhibiting factors. Journal of Asynchronous Learning Networks. 4(1). Schoepp, K. (2005). Barriers to technology integration in a technology-rich environment. Learning and Teaching in Higher Education: Gulf Perspectives, 2 (1), 1-24. Uluyol, C. (2013). ICT integration in Turkish schools: recall where you are coming from to recog- nise where you are going to. British Journal of Educational Technology, 44, 1, E10–E13. YEGITEK, (2012). Firsatlari Artirma Teknolojiyi Iyilestirme Hareketi (FATIH) Projesi Pilot Uygu- lama Degerlendirmesi. Yıldırım, S. (2007). Current utilization of ICT in Turkish basic education schools: a review of teacher’s ICT use and barriers to integration. International Journal of Instructional Media. 34(2), 171-186. Yildirim, A., Simsek, H. (2008). Sosyal bilimlerde nitel arastirma yontemleri, Ankara: Seckin. ISNAD Gök, Ali , Yıldırım, Zahide . "FATİH Projesi Kapsamındaki Hizmetiçi Eğitimler Hakkında Öğretmenlerin Görüşleri ve İhtiyaçları". 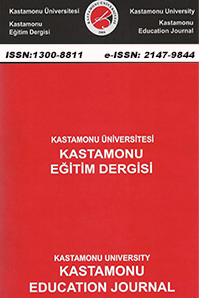 Kastamonu Eğitim Dergisi 24 / 3 (July 2016): 1453-1468.